For a course that’s just 12 years old, the Wales National is far more mature than you’d expect it to be. But it’s the scale of the course that is most striking, and not just the monstrous 7,433 yards the card can stretch to from the tips. The trees are tall, the bunkers are expansive, and the water features are certainly more lake than pond. Avoiding the hazards is very much the order of the day if you’re to keep your scoring in check, but that’s considerably easier said than done. The Peter Johnson designed Wales National offers a mixture of wide fairways and funnel fairways, driveable par fours and out of reach par fives, doglegs in both directions, and the aforementioned water hazards at different times in line of sight for right and left handed players. In short, it’s varied, and that’s its great joy. There’s no fear of getting bored here. The length of the course sounds more intimidating than it is in practice as very few people will choose to peg it up from the back tees, and, thankfully, there are several teeing options. Choosing the right tee for your game, you’re still guaranteed an enjoyably stern but fair examination. 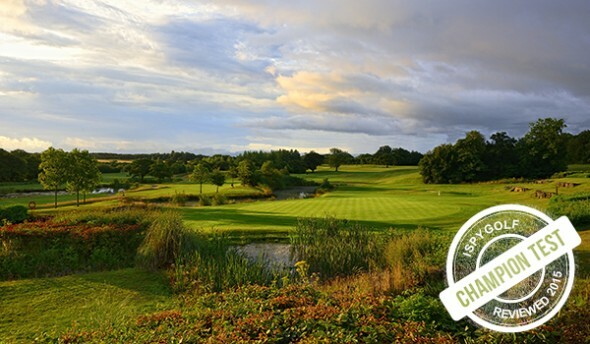 The Wales National is an entirely apt name, as the course is one of the strongest parkland courses in the country and is deserving of its status – and its formidable Standard Scratch Score of 75. A particularly difficult par five thanks to an especially tight, tunnel-like fairway that descends down the hill between the woodland, this is a genuine three shot par five in to the prevailing wind – even with two decent opening shots you may still find yourself laying up in front of the water with your third! An enticing downhill par four. Big hitters will consider taking on the green from the tee, while for most the choice is a longer tee shot and a flick over the water, or a lay-up much further back followed by a mid-iron approach. Every option opens up a chance for a birdie, but it’s just as easy to drop shots. A strategist’s delight. Aiming just left of the bunkers from the tee on the signature par five 10th hole, only the very best drive leaves a decision on whether to attack the green. For most, the lay-up will be the right play, but a bunker on the right guards the widest point of the fairway, and a fantastic lake lines the entire left hand side and front portion of the green. Certainly one of the best holes on the course. A fine run of holes that opens with a par four that has one of the most remarkable greens you’ll see, surrounded by rocky flower beds and tall grasses. The dangerous looking par three that follows plays dauntingly across the water, but the two tier green can be used to your advantage if the pin is at the front. The short par five 15th is a scoring chance but water demands you’re brave, as it does again on the dogleg par four 16th that finishes this “make or break” stretch. In the high season, the Wales National is in the top bracket of parkland courses. Modern, varied, and very attractive, it’s a course that demands length and precision and which tests without ever tipping into brutality. Play well here and you’ll feel very satisfied. A true championship course.